ROHINGYA YOUTH ASSOCIATION: "Public War Coming in Rakhine"
"Public War Coming in Rakhine"
Burmese newspaper of 21 July reported- "Public War Coming in Rakhine"
the report said- "Associations like public military will be formed in Maungdaw. It will be formed by ethnic nationals to protect from different races' terrorizing". A dozen Muslim students on Monday morning staged a quiet protest in front of Government House in Bangkok, where Myanmar President Thein Sein inspected a guard of honour together with Prime Minister Yingluck Shinawatra. Ashar Sarimachi, a fourth-year political science student of Thammasat University, led the group, who held placards saying "Stop the massacre of Rohingya". 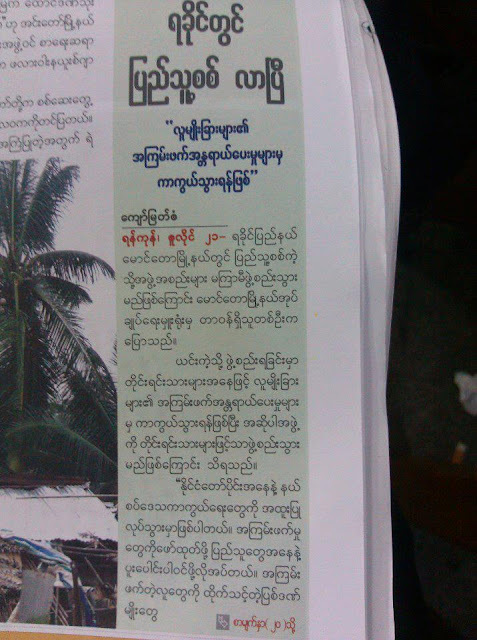 Mr Ashar said the information released about incidents during the events in Rakhine state last month and had been twisted and was misleading. 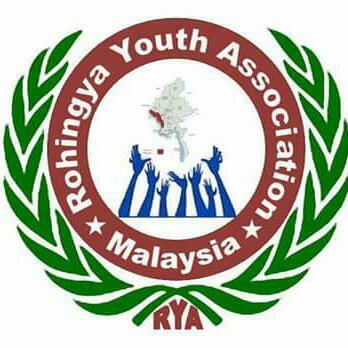 "The Rohingya were protrayed as instigators of the spate of violence, but they were actually the abused," said Mr Ashar, chairman of the Confederation of Muslim Students in Thailand. The 12 student protesters called on the Myanmar government to allow greater humanitarian access to the affected area and for government protection of this minority group. The statement was issued in the name of five student organisations. 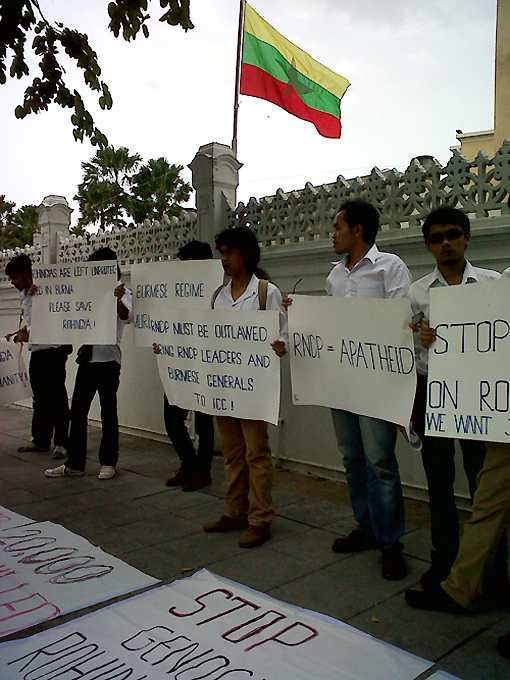 Another group holding protest signs about Rohingya-Arakanese incidents also gathered outside the Myanmar Embassy. the crisis according to its statement. 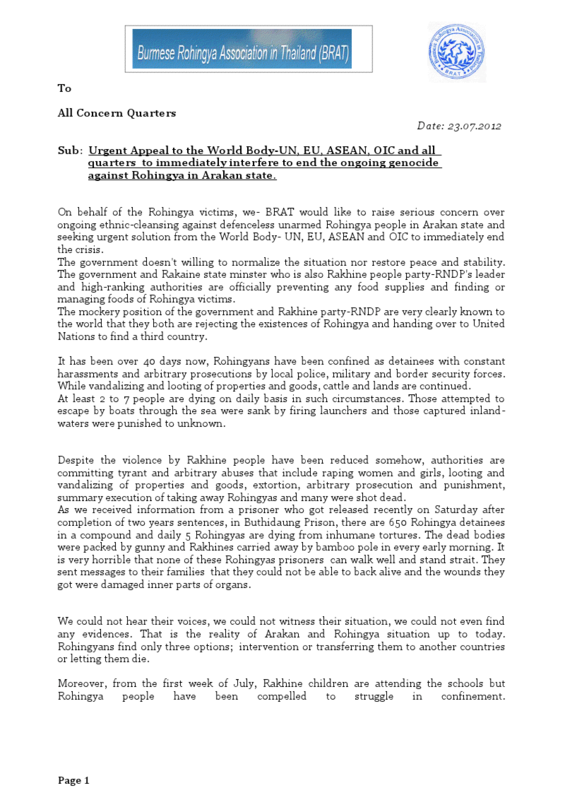 Burmese Rohingya Association in Thailand-BRAT's statement expresses about ongoing summary execution of Rohingya detainees in Buthidaung Prison. got were damaged inner parts of organs."